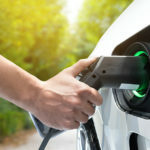 Posted November 26, 2018 by Charged EVs & filed under Newswire, Sponsored Content. HBM eDrive is a system for testing electrical inverters and electrical machines. Mechanical signals (e.g., torque) and electrical signals (current, voltage) are acquired simultaneously, helping to better understand the electric drive and its losses in minutes. This is important for the optimization of the drive as well as the increase in efficiency. In contrast to conventional power analyzers, HBM eDrive Testing acts as both a power analyzer and data acquisition system. It has the ability to record all signals along the drive train (power source, inverter, torque and speed of a motor, temperatures, CAN signals, strain, vibration, etc.) with a single instrument. This greatly reduces the test complexity and results in synchronous measurement of all parameters.